Extensions could be done on this by altering ingredients for fuel generation. Good analysis component for linking lab to current real world industrial processes associated with the creation of bio-fuels. Clearly ideal for chemistry class. Biofuels are a complex topic, and they have both benefits and drawbacks. 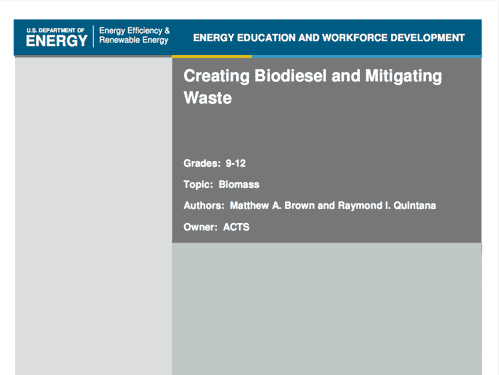 For example, emissions from biodiesel combustion may be more toxic than those from from conventional diesel combustion. This article from UCLA steps through some of the pros and cons, [link http://www.environment.ucla.edu/reportcard/article7320.html 'Biodiesel fuels']. Emerging science is questioning whether biofuels can truly be considered carbon neutral. Educators are advised to seek current information on this topic. Here is one article from 2016, [link https://www.sciencedaily.com/releases/2016/08/160825084633.htm 'Biofuels increase, rather than decrease, heat-trapping carbon dioxide emissions']. However, this point is moot when burning waste vegetable oil, as in this particular activity. Comments from expert scientist: The brief discussion that compares the chemical properties of vegetable-based diesel fuel to petroleum-based diesel fuel is informative. The figure that shows how a triglyceride can be transformed into?glycerol and methyl esters of fatty acids is very useful. Grades 9 and 10 would require substantial scaffolding and lab support with some components pre-prepared by teacher. Requires a fume hood for in-class preparation.